The new Teesnap point-of-sale system will require the Golf Club to issue new gift cards to golfers with existing Downers Grove Park District gift cards. 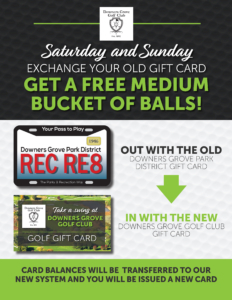 Stop by the Clubhouse this Saturday and Sunday (March 23 and 24) from 9 am to 3 pm to swap your old gift card for a new Downers Grove Golf Club gift card (balances will be transferred). As a thank you, golfers will receive a FREE medium bucket of balls for the driving range. 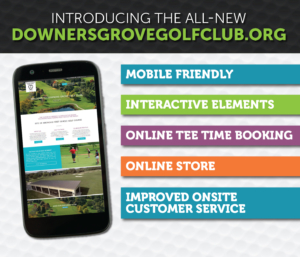 Welcome to the all-new Downers Grove Golf Club website! Just in time for the 2019 golf season, the Downers Grove Park District has partnered with Teesnap, a golf course management system, to provide golfers at the Downers Grove Golf Club with an improved visitor experience. This web-based solution includes an all-new, mobile-friendly website as well as an improved onsite point-of-sale system. The new website features easy navigation, search engine optimization, an integrated tee time reservation solution and online store. 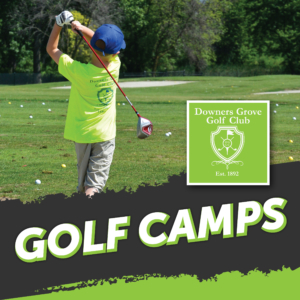 Golfers can visit downersgrovegolfclub.org to explore the unique history and recreational opportunities offered at the Downers Grove Golf Club. Information regarding lessons, leagues, tournaments, events and programs is available at the click of a button. Interactive elements including a course flyover and drone footage of the new driving range shelter highlight the spectacular scenery of this challenging and historic course. Through the online booking system, golfers can easily view available tee times, reserve spots for multiple players and pay in advance. The online store offers gift cards and range cards for purchase in addition to packages for private golf lessons with our Golf Professionals. Sally Hayduck, Superintendent of Customer Service at the Downers Grove Park District, is thrilled that the Teesnap management system will also improve onsite customer service at the golf course. The course at the Downers Grove Golf Club is now open for the 2019 season (weather permitting). On chilly or raining spring days, golfers can hit a few balls under the new heated driving range shelter. Buckets of balls can be purchased at the range shelter for as little as $6. 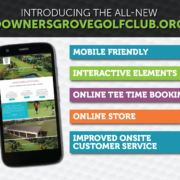 https://www.downersgrovegolfclub.org/wp-content/uploads/2019/03/2019-GOLF-WebsiteAnnouncement-WEB.jpg 1250 1458 Sally Hayduck https://www.downersgrovegolfclub.org/wp-content/uploads/2019/01/DownersLogo.jpg Sally Hayduck2019-03-21 13:20:552019-03-21 13:21:55Welcome to the all-new Downers Grove Golf Club website!